A bartender is a worker who mixes and serves drinks to customers, either directly from patrons at the bar, or through waiters and waitresses who place drink orders for dining room customers. They must know a wide range of drink recipes and be able to mix drinks accurately, quickly, and without waste. Many bartenders are promoted from other jobs at the establishments in which they work. Bartenders at upscale establishments usually have attended bartending classes or have previous work experience. Most states require workers who serve alcoholic beverages to be at least 18 years old. Bartenders must be familiar with state and local laws concerning the sale of alcoholic beverages. Most bartenders receive on-the-job training, usually lasting a few weeks, under the guidance of an experienced bartender. Training focuses on cocktail recipes, bar-setup procedures, and customer service, including how to handle unruly customers and other challenging situations. In establishments where bartenders serve food, the training may cover teamwork and proper food-handling procedures. Many states and localities require bartenders to complete a responsible-server course. The course is related to state and local alcohol laws, responsible serving practices, and conflict management. Courses may be available both in person and online. Depending on the state and locality, the server, owner, manager, or business may maintain a license to sell alcohol. Employees who complete alcohol seller-server training are able to prevent sales to minors, recognize signs of intoxication, reduce liability, and effectively intervene in problem situations. Bartenders fill drink orders either directly from customers at the bar or through waiters and waitresses who place drink orders for dining room customers. Bartenders must know a wide range of drink recipes and be able to mix drinks correctly and quickly. They also must work well with waiters and waitresses and other kitchen staff to ensure that customers receive prompt service. Some establishments, especially busy establishments with many customers, use equipment that automatically measures and pours drinks at the push of a button. Bartenders who use this equipment, however, still must become familiar with the ingredients for special drink requests and be able to work quickly to handle numerous drink orders. In addition to mixing and serving drinks, bartenders stock and prepare garnishes for drinks and maintain an adequate supply of ice, glasses, and other bar supplies. They also wash glassware and utensils and serve food to customers who eat at the bar. Bartenders are usually responsible for ordering and maintaining an inventory of liquor, mixers, and other bar supplies. Employment of bartenders is projected to grow 2 percent from 2016 to 2026, slower than the average for all occupations. Population and income growth are expected to result in more demand for food, drinks, and entertainment. This increased demand is expected to be met with increased bartender employment in full-service restaurants, which is projected to increase 7 percent. 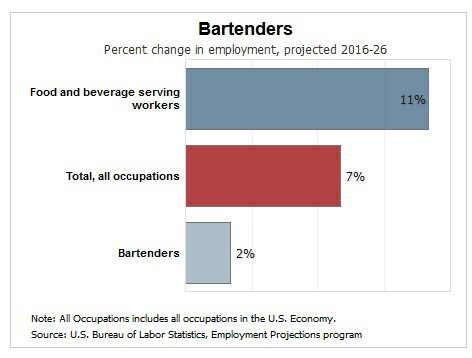 Bartender employment in drinking places, on the other hand, is projected to decrease 8 percent over the next ten years, as customers increasingly obtain these services at full-service restaurants and some local bars close. Job prospects are expected to be very good because of the need to replace the many workers who leave the occupation each year. on the Internet at https://www.bls.gov/ooh/food-preparation-and-serving/bartenders.htm (visited June 01, 2018).